A man has been arrested in connection with a fatal collision in Lingfield yesterday evening (24 February). A 49-year-old man from Lingfield was arrested this morning for death by dangerous driving, causing death by careless driving whilst unfit through drink or drugs and failing to stop at the scene of the collision. He is currently in police custody. 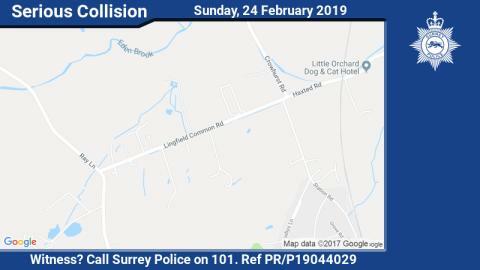 The collision took place around 5pm on Lingfield Common Road at the junction with Cobham Close between a car and a pedal cyclist. The male cyclist was sadly pronounced dead at the scene. If you witnessed the incident, please contact us on 101 or tell us online via or http://surrey.police.uk/TellUsMorequoting reference PR/P19044029.